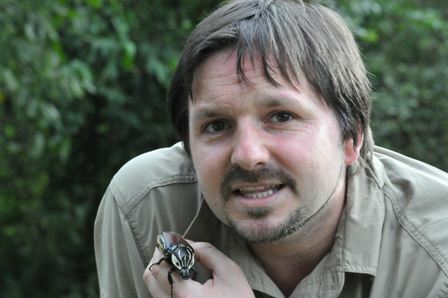 Dr Stewart Plaistow from the University’s Institute of Integrative Biology, is photographed here holding an African Goliath beetle – one of the biggest beetles in the world – as part of his work with undergraduate students on tropical ecology in Uganda. Dr Plaistow takes a group of second year undergraduate students to Kibale and Queen Elizabeth National Parks every year to learn about tropical ecosystem function, primate ecology and forest dynamics, as well as human-wildlife conflict issues. Students on the course learn how to use numerous field techniques to investigate the long-term effect of tree felling on the diversity of avifauna, the microclimate, and vegetation dynamics. The students design and carry out their own six-day research projects, with topics including ant foraging, dung beetle ecology, primate vigilance, and pollination biology. The final aspect of the course focuses on eco-tourism and its implications for conservation biology. Dr Plaistow said: “Queen Elizabeth National Park is a fascinating place to work and for the students to experience. It boasts more than 600 species of bird and over 100 species of mammal including hippos, warthogs, elephants and lions. Such high biodiversity explains why Queen Elizabeth is the most visited National Park in Uganda and an ideal place to study ecotourism in action. For more information on the Tropical Ecology module, please visit the website.